We asked a few reloaders: “What is your favorite ‘don’t know how you ever lived without it’ piece of reloading equipment?” Check out their answers below. We would love to hear from you too, please share your response in the comments below. Sierra Bullets Ballistic Technician Duane Siercks answered “I don’t know that you would actually call this equipment, but the item that comes to mind would be my reloading room. I had always had to squeeze everything into a corner or even an unheated shed. After we bought our current house, I built a garage and placed it so that I had a window looking down a 250 yard range. I built a dedicated room with heat and A/C. It contains my reloading bench and a shooting bench. The shooting bench lets me slide open the window and shoot down the range. It is very handy to not have to load everything up to go to the range. It also makes load development a lot simpler and efficient. I don’t know how I ever got along without it. This entry was posted in Reloading and tagged annealing, brass annealing, Dillon 650, electronic scale, handloading, long range shooting, RCBS, RCBS Rock Chucker, Redding, reloading, reloading press. Bookmark the permalink. 29 Responses to What is Your Favorite Piece of Reloading Equipment? My Chronograph, because without It, I would not truly know if some of those other neat tools, gadgets and even myself are doing a CONSISTENT job at reloading. Impossible for me to pick just one, but the two I am really enjoying at this time are my Pacific press and Wilson Case Gauge! Forming .300 Blackout from 5.56 brass and the two just make it so easy! I have an old Lyman Acculine I am fond of. The rotors are no longer available but they aren’t hard to make. I made one that throws 2.8 grains of Bullseye. I am sentimental about it. It was given to me by a very fine man who is no longer with us. RCBS makes something similar. 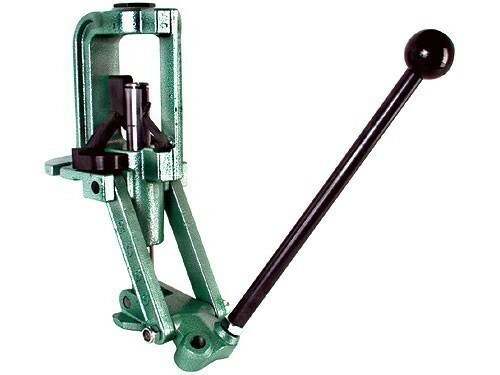 Dillon 550B. I’ve loaded thousands of rounds with this progressive press. Of many calibers including rifle rounds. Its such an impressive and dependable machine. And if something appears that I can’t fix, then I call Dillon Precision and they fix it by phone. A simple dependable machine. I love em all! my co-ax, wilson trimmer, 21c hand primer, bench source annealer, redding bench rest dies, tuned old ohaus 10-10, redding br thrower and my optivisor 3x and 10x jewelers loupe so I can see stuff that really dosent matter. the old spoon was getting real old! Been reloading for a long time now , I’ve always appreciate good quality equipment and I can’t say enough good things about my Redding dies and presses. My Rifle. For without the proper unloading of ammunition, all my reloading tools would be useless. L.E. Wilson case trimmer. After close to 40 years of hand loading and going through a few trimmers, this is the best. It is a pleasure to use and is absolutely accurate. A real good set of scales for powder charges. For me it is the clearly the Harrell’s Classic Culver powder measure. Literally, 10’s of 1000’s of hand loads over have been made with my measure in the last 20 years. Works as well today as when purchased. I may change dies, presses, trimmers, scales, neck turners, etc., but the only tool which does not not change is my Harrell’s. Redding T-7 turret press is my current fav. Great press. Built like a tank and produces super accurate reloads. Hum, Forster Co Ax press, RCBS Chargmaster, or my LE Wilson trimmer. I don’t think I could reload without any of them. Mo Defina runs Master Class Sports; MCS Inc.
Until a friend gave me one of his old Mo’s gauges for headspace, it was all guesswork. RCBS later copied them in a cheaper configuration in every sense of that word. I have Mo’s gauges for 30 BR, 308, 30-06, 6.5×284. The 30 BR also works for 6BR, and the 6.5×284 also works for the std 284. He also made me some custom scope rails and caters mostly to Palma and ATC shooters. At one time he owned the action company now known as Time Precision, and I have one of those actions (It was labelled PAS; the action is the SLV) with a Shehane ST1000 and 8 twist Krieger in 6DX. My Sierra reloading manual, as I reload for several calibers on my Dillion and RCBS early Rock Chucker press. I’m glad to see that the CO-AX is featured, I have used one since 1978. A great piece of equipment. K&M neck trimmer. Turning necks has virtually eliminated fliers. This tool is an absolute pleasure to work with, and there’s no galling on the case ID’s. Coupled with an 8 volt Dewalt screwdriver and the Ergo holder, the process moves right along.